When asked why the suspect was allowed to buy a gun, officials said it had not been determined that she had a "propensity for violence to self or others"
The woman who killed three people and wounded others before shooting herself to death at a Maryland drugstore warehouse had been diagnosed with a mental illness and used a legally purchased gun in the rampage, a law enforcement official said Friday. Harford County Sheriff Jeffrey Gahler told news reporters Friday that the suspect, 26-year-old Snochia Moseley of Baltimore County, had been diagnosed with a mental illness in 2016. "That's as far as I'll go with it," he said, declining to give any more details about the illness. He said Moseley had become increasingly agitated in recent weeks, and relatives had been concerned for her well-being. Gahler said she used a handgun that she legally purchased in March to fire a total of 13 rounds Thursday morning and died after shooting herself in the head. Gahler identified the three people Moseley fatally shot as Sunday Aguda, a 45-year-old man from Baltimore County; Hayleen Reyes, a 41-year-old woman from Baltimore; and Brindra Giri, a 41-year-old woman from Baltimore County. A family friend said Giri was a mother of two and recent immigrant from Nepal whose relatives were devastated. Attempts to reach family members of the other victims were not immediately successful. The sheriff identified the wounded survivors as Hassan Mitchell, a 19-year-old man from Harford County; Wilfredo Villegas, a 45-year-old man from Montgomery County; and Acharya Purna, a 45-year-old man from New York. He also gave more details about how the violence unfolded. Moseley had been hired for the holiday season and had been working there for less than two weeks. She entered the building at 6:30 a.m. As people lined up to come in the building, Gahler said she cut in line and words were exchanged, but it was a "little incident." She left around 7:21 a.m. Moseley, who had worked security jobs in the past, drove to her White Marsh home and got a handgun, pepper spray and handcuffs. She arrived back at the parking lot around 8:35 a.m. and entered the front door around 8:52 a.m. He says she pulled a hooded shirt over her head and began shooting, striking and killing Aguda outside the building. Inside, where there were about 65 people, she fatally shot Giri and Reyes and also shot Mitchell, Villegas and Purna, who survived. She shot herself twice before police arrived, he said — once with a grazing wound and then with the fatal shot. She was already down when officers arrived and an officer moved her from the scene, not knowing that she was the shooter, he said. When asked how Moseley could legally buy a gun after being diagnosed with a mental illness, officials said it had not been determined that she had a "propensity for violence to self or others." The sheriff said the motive is still a mystery and may remain so. "There's just no way to make sense of something so senseless," he said. "There's still a lot of questions that we don't know." The shooting sent survivors screaming and running in all directions from the Rite Aid distribution center in northeastern Maryland. Others nearby helped the wounded, and one person tied blood-soaked jeans around an injured man's leg trying to stanch the bleeding. Worker Walter Zambrano, 64, said he was fortunate that he was in a bathroom when shooting broke out during a 9 a.m. morning break, when workers were gathering in a cafeteria. He hid in the bathroom until the shooting stopped, fearing for his life. The person was "shooting like crazy, bam! bam! bam!" Zambrano said, speaking in Spanish. "Everyone was screaming, running this way and that. I didn't know which way to run." On Thursday, 33-year-old Dominique Norton of Aberdeen, endured an excruciating wait of nearly two hours to be reunited with her mother, 62-year-old warehouse worker Irene Norton. The younger woman said she didn't know that her mother was unharmed until she got off a bus at the fire station and they tearfully embraced. "I busted out crying. I was relieved and shaken," she said. "I am praying for all of the victims." Giri had joined her husband in the U.S. in April, bringing her son and daughter and thinking the children would do well here, said Harry Bhandari, a community leader and candidate for Maryland state delegate who said he has known her family for about 10 years. Giri was an energetic hard worker who saw the job at the distribution center as a "stepping stone," said Bhandari, who was at a funeral home with her relatives Friday afternoon as they made arrangements. Speaking through Bhandari, Giri's husband said they had married young and were happy together and that there was not a bad thing to say about her. 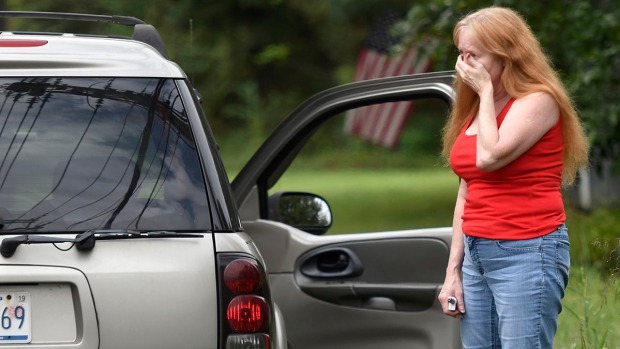 The attack came nearly three months after a man with a shotgun attacked a newspaper office in Annapolis, Maryland, killing five staff members. 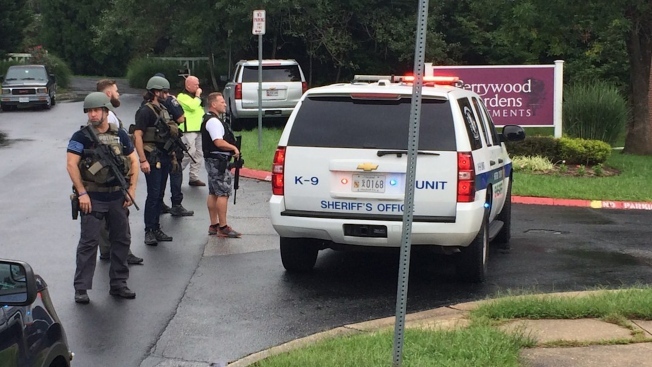 Authorities accused Jarrod W. Ramos of attacking The Capital Gazette because of a longstanding grudge against the paper. It came less than a year after a fatal workplace shooting less than 10 miles from the warehouse, in which five were shot, three fatally. Harford County Executive Barry Glassman said that, unfortunately, shooting like this are "becoming a too-often occurrence" in the nation.